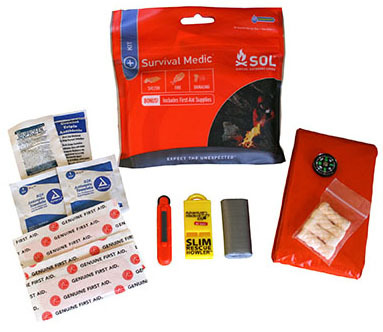 Day hikers, campers, fishermen and hunters would be wise to have one of these little SOL kits in their pack. A year does not pass when a hiker doesn’t become disoriented, lost or injured in the mountains. Most are picked up the following day, after spending a harrowing night alone. The Survival Medic kit is not a first aid kit per se, it is a survival tool intended to allow an individual to survive some pretty tough conditions when they are lost or disoriented. The addition of a few extra first aid items are there to handle the few cuts and scrapes that might have resulted from the experience. The small button compass is not a toy. It is actually a working compass that reliably provides the user with direction. The fire starter works well with the “tinder” provided and the emergency blanket is more than adequate at 56”x84” to make a shelter or to wrap yourself in for warmth. One of the best features of this little kit is the survival instruction sheet prepared by Buck Tilton and SOL personnel. This includes more than 52 life saving tools and techniques and it is totally waterproof. We would personally recommend that everyone who hikes, hunts or spends time out in the wilderness carry one of these kits. We unpacked and repacked the kit four times to determine how durable the Dryflex™ storage pouch was. The seams did not split and the pack repacked and re-sealed easily. It goes without saying that an unopened, factory-sealed kit is waterproof. However, we wanted to determine whether a resealed pouch was waterproof. We dropped our resealed kit into the dog’s water bowl. No leaks after 15 minutes, everything was dry. We added a couple of extras to our personal kit, based on our experience and preferences. A couple more bandages, two more ibuprophen tabs and forceps for removing the cactus spines common in the southwest. While these are not essential for overnight survival, or even for a couple of days, we have a tendency to want a bit extra to “cover our bases.” After Jim’s legs “harvested” a full crop of prickly pear cactus spines in the Floridas Mountains of New Mexico while chasing Ibex, he wants forceps.